Butter 4 large ramekin dishes and dust insides with ground almonds. Break up 150g from a Waitrose bar of Continental Plain Chocolate and put in a bowl with 4 tbsp strong black coffee. Melt over a pan of hot water, or in the microwave on medium power for 1-11/2 minutes, stirring gently to melt the chocolate, then cool slightly. Separate 3 large straw bedded eggs. Stir the yolks into the chocolate with 50g caster sugar. Whisk the whites until stiff, then whisk in another 50g caster sugar, a tablespoonful at a time. 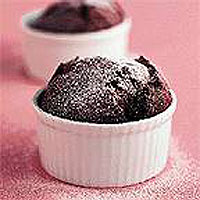 Fold into the chocolate and divide between the ramekins. Bake in a preheated oven at 190°C, gas mark 5, for 12-15 minutes, until risen. Don't worry if they are cracked or uneven _ this is normal. Serve immediately with single cream.